1.Can you introduce the band history to our readers please? Where’d the name come from? Hi there. First of all thanks for interviewing us. We guess you will not agree with some of our points of view, but we are going to answer your questions with total honesty. That’s how we are. Opcio K95 was born in 1995. We are and will always be antifascist fighters and we built the band as a way to express our rage and anger. We have always understood our music as a compliment to our daily fight, this is, class fight. Our name is the shortcut for Opcio Kalashnikov. This means the “Kalashnikov way”, as the AK47 has always been associated with the antifascist fighters around the world. 2.WHAT bands would you say most influence the bands music and yourselves? Maybe at the beginning we were influenced by some bands. Musically talking, we wanted to sound just a pure oi! Band. But with the years we think we have developed our own style and our biggest influence are ourselves and some friend bands such as Desperta Ferro, Brigada FM, Brixton Cats, Stage Bottles, Los Fastidios… we try to develop our music from within. are you a communist band or redskin keeping up the left wings beliefs ? What does it mean to you to be a political band ? Lyrics just come along. We do not have any particular member writing the lyrics and we are quite proud to write the songs all together. Of course there is not too much politics because everything is politics. We do believe we are a political band. If one day we don’t believe this, OK95 will no longer exist, so you can guess how important this is for us. 4.I’ve seen on your myspace pictures of Mao, Marx and Lenin. Are they really heroes for you? Communism has more casualties than nazis. What should a free society be like in your opinion? I don’t think you can find any Mao references in our band, but anyhow, we do not take heroes. Only inspiration. Concerning the point that communism has caused more casualties than Nazism, that’s your opinion and we do not agree with you at all. 5.what do you think about anarchism don’t you think its more clear than communism? I know every country has a different tradition and stereotypes. For me as a Pole , calling myself Stalinist is the same thing as nazis. Both systems smashed my country for the last 60 years. Why in Spain, Catalunya and Italy are there so many Stalinists? Again we disagree with this point. In Catalunya there are not so many Stalinist as you say. Of course in every country you can find different histories and that’s exactly why we define ourselves as socialists. 6.Can you tell me something about your song “bcn120” What is it about? 7. What do you think generally about politics in the Oi/punk scene? In Poland there are many punks and skins, which reject politics in the punk scene. Most of them call themselves apolitic but they hang out with nazi scum. Yes, regretfully this seems an international trend and lots of so-called apolitics are quite right wing people. 8. We can see in Poland during last few years decline of orthodox Nazi-skinhead movement and oppositely - the rise of apolitical or antifascist skinheads. Is it the same in Catalunya, or not? I heard about Carlos (respect) killed by nazi scum. I think in your site there is strong antifascist skinhead movement? To take revenge I hope all those nazi shits will be hanged on the trees soon! We wish it would be true, but regretfully there is always plenty of nazi scum everywhere. We’ve seen lots of comrades just giving in and on the other hand, lots of young people joining the antifa scene and facing the right wing actions. So it is difficult to say which side is bigger or stronger, but we know who is right> we are. 9.What you think about RASH movement? Is it right to mix two different political points of views but with similar ideas ? We have always supported RASH as we believe in antifa unity. 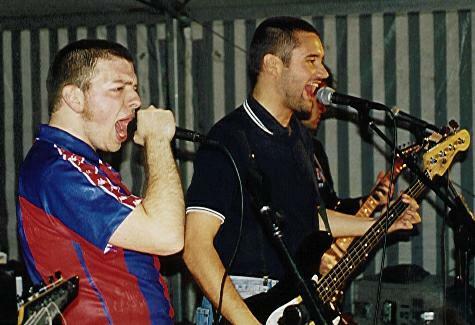 We have played a lot for RASH groups all around Europe. It’s a pity that as always, you can find people more interested in destroying this unity than fighting the real enemy. 10.DO YOU HAVE ANY PROBLEMS WITH NAZIS IN YOUR COUNTRY? Are there alot OF THEM? HOW IS THE ANTIFASCIST SKINHEAD SCENE IN CATALUNYA? Of course we have. They are our enemy. As I said, antifa scene is healthy and strong, and also young. May be there is a bit of lack of organization. 11.by the way I would like to ask you about band from Barcelona as well that are called ULTIMO ASALTO apolitic oi! I heard they have some connections with right wing wankers is that true??? What do you think about this band? We do not like to talk about other people. You should ask them directly. 12.Which new good Oi! Punk bands from Catalunya would you recommend for the Skinhead Revolt readers? We have had always a very good relationship with other bands of our country. First we played a lot with Pilseners and Suburban Rebels, later with Remences. 13.You played in Germany few times and in France? what other countries did you play and how was there? it's big different bettwen catalan scene? 14.whats the plans for the near future? Any new songs maybe a new album??? ?